Premium-quality micrograin carbide tips are ground on specialized CNC equipment for an extra-fine finish with maximum sharpness and edge retention. 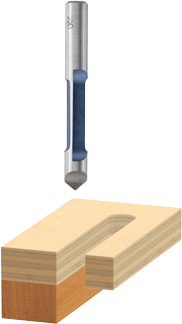 Pilot panel bit has a drill-through point that plunges through the material, and is used for window and door cutouts in abrasive insulation materials, plywood, and paneling. The fully hardened and tempered steel shank provides ultimate durability. 85244MC 1/4" 3/4" 1/4" 2-1/2"
85245SMC 3/8 In. x 1 In. Carbide-Tipped Single-Flute Shear Angle Pilot Panel Router Bit 3/8" 1" 3/8" 2-5/8"
85245SB50 3/8" 1" 3/8" 2-5/8"
85246MB50 50 pieces 1/2 In. x 1-3/16 In. Carbide Tipped 1-Flute Pilot Panel Concave Bits 1/2" 1-3/16" 1/2" 3-1/2"
85245MB50 50 pieces 3/8 In. x 1 In. Carbide Tipped 1-Flute Pilot Panel Concave Bits 3/8" 1" 3/8" 3"
85407M 1/2 In. x 2 In. Carbide Tipped 1-Flute Pilot Panel Straight Bit 1/2" 2" 1/2" 4-3/4"
85146 High-speed steel 1/4" 3/4" 1/4" 2-5/8"
85146B50 High-speed steel 1/4" 3/4" 1/4" 2-5/8"
85147 3/8 In. x 7/8 In. High Speed Steel 1-Flute Pilot Panel Straight Bit 3/8" 7/8" 3/8" 3"
85147B50 High-speed steel 3/8" 7/8" 3/8" 3"
85188 1/2 In. x 1-1/8 In. High Speed Steel 1-Flute Pilot Panel Straight Bit 1/2" 1-1/8" 1/2" 3-5/8"
85244B50 Carbide tipped - straight flute 1/4" 3/4" 1/4" 2-9/16"
85244M 1/4 In. x 3/4 In. Carbide Tipped 1-Flute Pilot Panel Concave Bit 1/4" 3/4" 1/4" 2-1/2"
85245 3/8 In. x 1 In. Carbide Tipped 1-Flute Pilot Panel Straight Bit 3/8" 1" 3/8" 3"
85245B50 50 pieces 3/8 In. x 1 In. Carbide Tipped 1-Flute Pilot Panel Straight Bits 3/8" 1" 3/8" 3"
85245M 3/8 In. x 1 In. Carbide Tipped 1-Flute Pilot Panel Concave Bit 3/8" 1" 3/8" 3"
85246 Carbide tipped - straight flute 1/2" 1-3/16" 1/2" 3-1/2"
85246B50 50 pieces 1/2 In. x 1-3/16 In. Carbide Tipped 1-Flute Pilot Panel Straight Bits 1/2" 1-3/16" 1/2" 3-1/2"
85246M 1/2 In. x 1-3/16 In. Carbide Tipped 1-Flute Pilot Panel Straight Bit 1/2" 1-3/16" 1/2" 3-1/2"